The Commodore Amiga CDTV is, in a way, the ancestor of the Amiga CD32 game console. Basically, it is an Amiga 500 with a CDROM drive. It was sold without keyboard or mouse, but it was possible to connect them to the CDTV. A 3.5" floppy disk drive (800 KB), was developed for this computer. It was designed to be a home entertainment device, but it was too expensive and only very little software was developed for this machine (Psygnosis made almost all the software for the CDTV). In fact, a few years later Philips succeeded with its CD-I where Commodore failed. There were two CDTV models : the CDTV-1 used the Amiga 500 hardware and the CDTV-2 used the Amiga 500+ hardware. 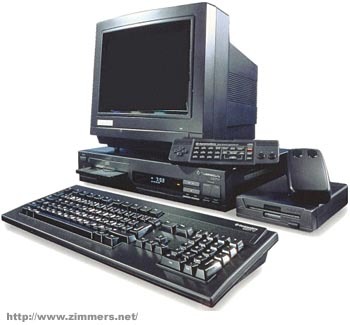 There even has been a prototype developed in 1992 called "CDTV-CR" (for Cost Reduced). Unlike other Amiga CR revisions, the CDTV CR was completely redesigned, utilizing the updated Amiga 600 technology (for more information, visit the Amiga Interactive Guide). The manager of the team promoting the CDTV was Nolan Bushnell, the man who founded Atari. By strange twist of fate, the man in charge of Atari at the time, was Jack Tramiel, the man who founded Commodore. see more Commodore CDTV Ebay auctions !